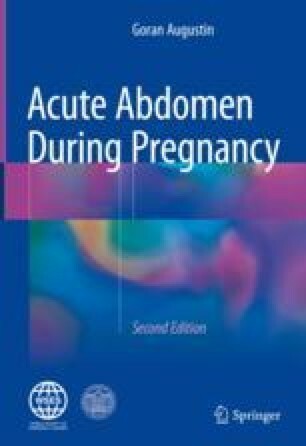 A diaphragmatic hernia is a rare condition during pregnancy, but symptomatic form carries high maternal and especially fetal mortality. Nonspecific symptoms are commonly attributed to other diseases especially because clinicians are reluctant to use plain chest X-ray which is often diagnostic. Fortunately, the use of thoracic sonography and thoracic MRI adds to earlier and more accurate diagnosis. As many cases present immediately after labor, abdominal and/or thoracic CT can be performed and is also diagnostic. If the patient is symptomatic, treatment is surgical mostly at the time of presentation. A treatment algorithm is less straightforward for asymptomatic patients detected during pregnancy. Some recommend surgical treatment to prevent complications during labor when increased intra-abdominal pressure occurs, while others operate only when symptoms develop. Type of the delivery is also not solved completely. While some recommend Cesarean section with simultaneous diaphragmatic hernia repair, others claim that vaginal delivery is safe with laparoscopic diaphragmatic hernia repair at a later date.